When Sankara finished his basic military training in 1966, he began his military career at 19 and was later sent to Madagascar for officer training and there he witnessed the famous uprising against the government of Philibert Tsiranana in 1971 and 1972. Also, it was in Madagascar he first read about the works of Karl marx and Vladimir lenin; this greatly influenced his political views for the rest of his life. Sankara was known to be a decent guitarist and he also played in a band called ‘Tout-à-Coup Jazz’ and also rode a motorcycle. 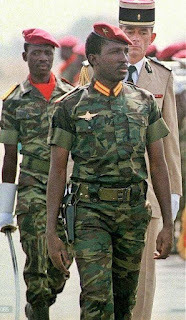 Another coup occurred in November 1982 which made Major-Doctor Jean-Baptiste Ouedraogo the head of state and Sankara the Prime Minister in January 1983. However, on the 17 May, this government was ousted and the head of state was placed under house arrest when the French president’s son came to the state. Thomas Sankara placed some words on marble in October 1984 when he said, ‘The revolution in Burkina Faso is based on man’s experience from the first breath of humanity. In Burkina Faso, we desire to be the heirs of all revolutions in the world; all the liberation struggles of the people in the Third World. Our lessons are from the American Revolution. We learnt from the French Revolution the rights of man. Also, the popular and great October Revolution brought about victory to the proletariat and made possible the reality of the Paris Commune’s dreams of justice’. On becoming the head of state, Sankara viewed himself as a revolutionary and was as well inspired by the revolution led by Cuba’s Fidel Castro and Che Guavara, as well as by the Ghana’s military leader Jerry Rawlings. When he became the president, he promoted a ‘Democratic and Popular Revolution’. In a speech by Sankara in October 1983 which was written by his close associate Valere Some, he described the ideology of the Revolution as ‘anti-imperialist’. Sankara’s policies include fighting corruption, averting famine, promoting reforestation, and making health and education priorities. When he ascended the head of state in 1984, he renamed the country from Upper Volta to Burkina Faso which means ‘Land of Upright People’, served in the two major languages of the country More and Djula. He as well gave a new flag and wrote a new national anthem (Une Seule Nuit). 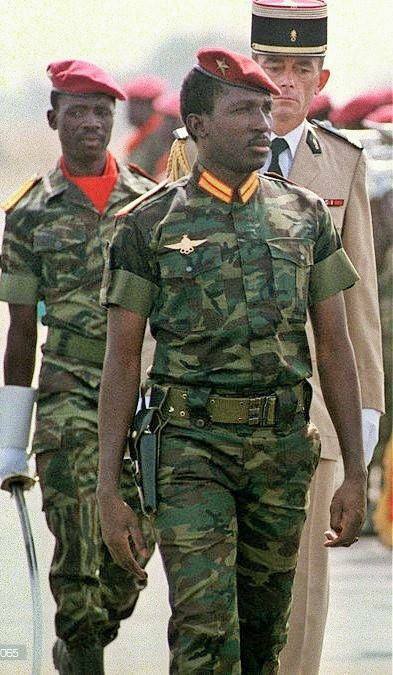 Immediately Sankara took office of the first man in Burkina Faso, he zeroed the powers by the tribal chiefs. He seized the tribute payments collected by the feudal landlords and made sure all their lands were distributed among the poor and peasants. This automatically increased the standard of living of the citizens and served an avenue to food self-sufficiency in Burkina Faso. In just four years of Sankara on the throne, Burkina Faso overcome food dependence and what they produced was enough to feed them all as a result of the distribution of lands, and series of irrigation and fertilization programs set up by the government. Also at this time, the production of wheat and cotton increased significantly; Burkina Faso produced 3,900 kilograms per hectare compared to 1,700 kilograms per hectare produced by the Sahel region in 1986. The Sankara strategy did not only make Burkina Faso self-sufficient in food production, but they also had a surplus. He as well worked on the production of cotton so that they can produce clothing for the people. Sankara made sure feeding, housing and medical care were the topmost priorities of his government. He launched a vaccination program to eradicate meningitis, polio and measles. The success of this made 2.5 million children to be vaccinated in just one week in Burkina Faso and this attracted accolades from the World Health Organization (WHO). Also, the Sankara’s government was the first to publicly acknowledge AIDS as a major threat to Africa. Sankara’s government capitalized on housing and infrastructure. In order to end urban slums, brick factories were built. To curb deforestation, People’s Harvest of Forest Nurseries, was created to supply villages of up to 7000 nurseries and also to organize the planting of several million trees. All the regions in Burkina Faso were connected by rail and road. Also, Burkina Faso laid more than 700 km of rail to facilitate the extraction of manganese without collecting a dime from foreign country or depending on foreign aid. All these was done by Sankara to prove to the outside world that Africa could be independent and still be prosperous without the help or aid of the foreign countries. Sankara’s strategies shook the world and changed the view of the world about Africa (we can actually do it, however, the greediness, selfishness and avarice of few has made them to sell us to the outside world for a morsel of bread and that is why an average African could die in power, because outside power, he is nothing). Sankara also had an interest in women upholding the tenets and theatrics of democracy. He said, ‘Revolution and women’s liberation are mutually inclusive. We can’t talk of women’s emancipation as a charity or because we are compassionate being humans. Women taking part is a basic necessity for the success of revolution. Women hold up the other half of the sky’. Sankara increased the status of an average woman in Burkina Faso, such that, his government had a large number of women. Sankara’s government banned forced marriages and polygamy, female genital mutilation, while also appointing women to high government positions, and allowed them to work outside the home and be in school even when pregnant.